A round of Sporting Clays might be just the boost you need to tune up for the following days hunt. Sharpen up that shooting eye and ease those jitters. But, to many, sporting clays is a standalone sport, dicey and competitive. On a windy day, the challenge is unsurpassed by any other shooting sport. Our course is fully automated with two traps at each station. During the cold weather season, we have 10 stations in operation with 12 during nice weather. Targets are changed frequently to provide new challenges for our shooters. 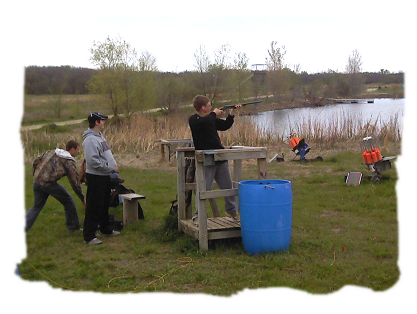 Some targets are set with limited difficulty as to provide the new or novice shooter the chance to score as well. The course is scenic and beautiful. Taking in the countryside with 2 large ponds to add to the excitement. Targets over water, launched from 30ft. Towers, skipping rabbits across the flatland and high flying Teal are just some of the challenges you will enjoy. We have a wide, gravel path walking the course but if you cannot walk it you are welcome to bring a golf cart or any other conveyance. The course is open all year round. Shooting hours are from 9:00AM to 4:00PM Wednesday thru Sunday. With notice we can open the course on Monday or Tuesday. The course is open year around, but inclement weather sometimes makes access to the traps difficult, so call ahead if there is a question about weather conditions. Don't Miss Out... Please Book Early! Schedule Your Event or Hunt Today! On Our Latest News & Hunts?